[PDF] What is this thing called Philosophy of Language? | Free eBooks Download - EBOOKEE! [PDF] What is this thing called Philosophy of Language? 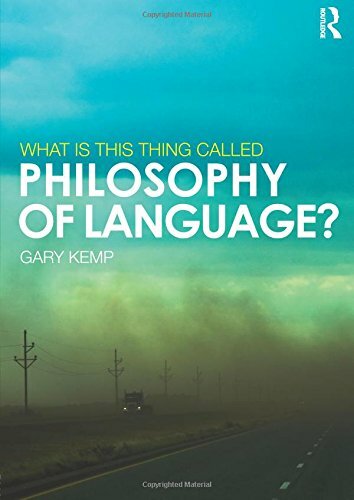 Description: Philosophy of language explores some of the fundamental yet most technical problems in philosophy, such as meaning and reference, semantics, and propositional attitudes. Some of its greatest exponents, including Gottlob Frege, Ludwig Wittgenstein and Bertrand Russell are amongst the major figures in the history of philosophy. In this clear and carefully structured introduction to the subject Gary Kemp explains the following key topics: â€¢ the basic nature of philosophy of language and its historical development â€¢ early arguments concerning the role of meaning, including cognitive meaning vs expressivism, context and compositionality â€¢ Fregeâ€™s arguments concerning sense and reference non-existent objects â€¢ Russell and the theory of definite descriptions â€¢ modern theories including Kripke and Putnam arguments concerning necessity, analyticity and natural kind terms â€¢ indexicality, context and modality. What are indexicals? â€¢ Davidsonâ€™s theory of language and the â€˜principle of charityâ€™ â€¢ propositional attitudes â€¢ Quineâ€™s naturalism and its consequences for philosophy of language. Chapter summaries, annotated further reading and a glossary make this an indispensable introduction to those teaching philosophy of language and will be particularly useful for students coming to the subject for the first time. No comments for "[PDF] What is this thing called Philosophy of Language? ".